El Mirador was among the earliest Mayan cities that grew to a huge size and enjoyed significant regional prominence and power. It was already an important city in the 6th century B.C. and reached its peak in the 3rd century B.C. when its population was between 100,000 and 250,000. Among its notable features were the stone monumental constructions and a large number of causeways which linked the internal structures of the city and the city itself with other cities. El Mirador was among the most important ancient Mayan cities. It was already a thriving city by the 6th century B.C. and continued to grow in size and influence in the subsequent centuries. Starting from 3rd century B.C., El Mirador was the most powerful and important Mayan city of the time. It housed monumental structures supported by a massive labor force from its huge population. Somewhere in the middle of the 2nd century B.C., El Mirador underwent significant decline and the city was abandoned, possibly after the threats of invasion. The city was later reoccupied in the 8th century although it was again abandoned, for the last time, in the 10th century. El Mirador was among the earliest Mayan cities that grew to a huge size and enjoyed significant regional prominence and power. El Mirador is home to some of the most imposing architecture that has survived over the course of history. La Danta is a temple at El Mirador which rises 230 feet above the floor of the forest, making it one of the largest pyramids in the world. Another major El Mirador structure is the El Tigre temple which is 180 feet high. Los Monsos is another extant architectural structure in the ruins of El Mirador which rises to a height of 156 feet. Like the architecture in nearly all major Mayan cities that came into being later, the structures of El Mirador have unusual alignments, possibly calculatedly so in view of the solar movements. La Danta is a pyramid-temple which rises to the extraordinary height of 230 feet. The temple was constructed on a massive platform which makes it one of the largest endeavors of human labor in the ancient world. It is an extant historic construction and is considered among the largest pyramids in the world. El Tigre is another extant construction at the El Mirador city. It reaches a height of 180 feet. Researchers claim that El Tigre, among other temples of the city, was constructed in alignment with the solar movements. Its construction is cited as an instance of careful urban planning for the construction, size and location of the buildings in the El Mirador city. One of the most notable features of the city of El Mirador are its causeways. These causeways link the internal structures of the city with each other. They further link El Mirador with other cities tens of miles away. The structure of the causeways is such that they rise a few meters above the level of the landscape around it and are up to 50 meters wide. A large number of such causeways existed within the El Mirador city and outside it as well. One causeway links the city to the Nakbe, a city 12 miles away from El Mirador. Another causeway is 20 kilometers long, linking El Mirador to El Tintal. These causeways were made of stone and called “sacbeob” in Mayan which means white road. El Mirador was first abandoned in the 2nd century B.C. It was reoccupied in the 7th century A.D. and its new occupants were interested in arts and ceramics. This is evident from the archaeological findings in El Mirador belonging to this second phase of occupation. Among the most notable discoveries is that of the Codex-style Ceramics which have been found nowhere else in the Mayan regions. This unique form of ceramics is defined by black lined drawings on a cream colored background done in an exceptionally fine style. Although El Mirador was at the peak of power and influence in the region during the 3rd century, it rapidly declined soon afterwards. By the middle of the 2nd century B.C., the site had already been abandoned by its inhabitants which in the time of its peak were estimated to be more than 100,000. Researchers have drawn attention to a wall 3 to 8 meters high which was constructed on the northern, eastern and southern sides of the city. This wall is dated to be around the same time as the estimated time of the city’s abandonment. So it has been theorized that the wall was built in order to ward off the threat of an invasion and it was probably this threat that eventually led to the abandonment of the city. After its abandonment in the 10th century, the ancient city of El Mirador was discovered in 1926. However, the city remained unexplored until 1978 when a detailed archaeological investigation of the site began and continued until 1983. 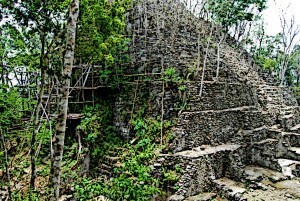 The discovery of El Mirador and the findings from the site were critically helpful for the researchers in understanding the earlier phases of the Mayan civilization. While later Mayan cities such as Tikal had already been discovered and investigated by the archaeologists, El Mirador was the first major ancient Mayan city that was discovered by them. El Mirador was among the oldest Mayan cities and probably the most influential Mayan city in the Preclassic era. It was already a major Mayan center in the 6th century B.C. and reached the peak of its height sometime during the 3rd century B.C. During this period, a number of monumental structures were erected in the city, some of them being the largest to have survived from the ancient world. The population of the city made it one of the largest in the ancient world, ranging between 100,000 and 250,000. It was abandoned in 2nd century B.C. and was re-occupied in the 8th century A.D. only to be abandoned again two centuries later.